(Broward County Sheriff's Office | The Associated Press) In this undated photo released by the Broward County Sheriff's office, Cesar Sayoc is seen in a booking photo, in Miami. 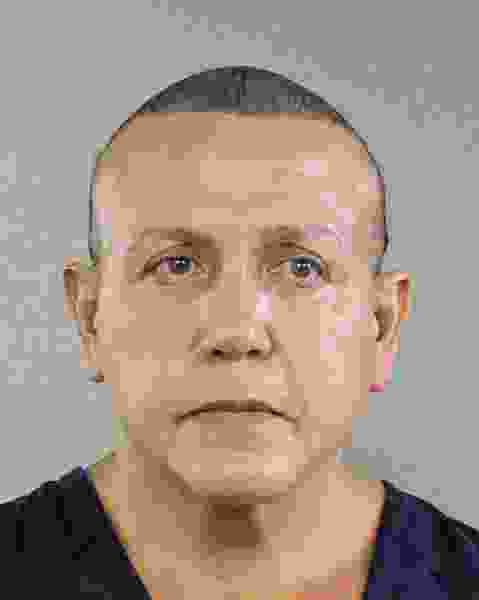 Federal authorities took Sayoc, 56, of Aventura, Fla., into custody Friday, Oct. 26, 2018 in Florida in connection with the mail-bomb scare that earlier widened to 12 suspicious packages, the FBI and Justice Department said. Washington • Federal authorities took a man into custody Friday in Florida in connection with the mail-bomb scare that earlier widened to 12 suspicious packages, the FBI and Justice Department said. The man was identified by law enforcement officials as Cesar Sayoc, 56, of Aventura, Florida. He was arrested at an auto parts store in the nearby city of Plantation. Court records show Sayoc has a history of arrests. Law enforcement officers were seen on television examining a white van, its windows covered with an assortment of stickers, in the city of Plantation in the Miami area. Authorities covered the vehicle with a blue tarp and took it away on the back of a flatbed truck. The stickers included images of American flags and what appeared to be logos of the Republican National Committee and CNN, though the writing surrounding those images was unclear. Investigators believe the mailings were staggered. The U.S. Postal Service searched their facilities 48 hours ago and the most recent packages didn't turn up. Officials don't think they were sitting in the system without being spotted. They were working to determine for sure. The officials spoke to The Associated Press on condition of anonymity to discuss an ongoing investigation. The FBI said the package to Booker was intercepted in Florida. The one discovered at a Manhattan postal facility was addressed to Clapper at CNN's address. An earlier package had been sent to former Obama CIA Director John Brennan via CNN in New York. Attorney General Jeff Sessions said Friday the Justice Department was dedicating every available resource to the investigation "and I can tell you this: We will find the person or persons responsible. We will bring them to justice." Trump claimed Friday he was being blamed for the mail bombs, complaining in a tweet sent before dawn: "Funny how lowly rated CNN, and others, can criticize me at will, even blaming me for the current spate of Bombs and ridiculously comparing this to September 11th and the Oklahoma City bombing, yet when I criticize them they go wild and scream, 'it's just not Presidential!'" The package to Clapper was addressed to him at CNN's Midtown Manhattan address. Clapper, a frequent Trump critic, told CNN that he was not surprised he was targeted and that he considered the actions "definitely domestic terrorism." Jeff Zucker, the president of CNN Worldwide, said in a note to staff that all mail to CNN domestic offices was being screened at off-site facilities. He said there was no imminent danger to the Time Warner Center, where CNN's New York office is located. At a press conference Thursday, officials in New York would not discuss possible motives or details on how the packages found their way into the postal system. Nor would they say why the packages hadn't detonated, but they stressed they were still treating them as "live devices." The devices were packaged in manila envelopes and carried U.S. postage stamps. They were being examined by technicians at the FBI's forensic lab in Quantico, Virginia. Trump, in a tweet Thursday, blamed the "Mainstream Media" for the anger in society. Brennan responded, tweeting that Trump should "Stop blaming others. Look in the mirror."